Kasia, as her name suggests, hails from Warsaw. She came to Britain fourteen years ago, learned English, studied at the London College of Communication and photography at the London College of Fashion. 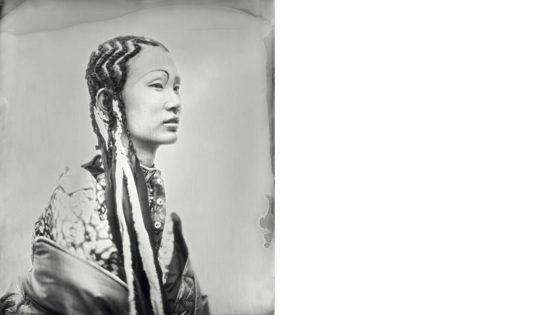 She first encountered wet plate collodion as a technique half way through her training, and was immediately fascinated by both the images it produces and how it slows down and intensifies the process of making a picture. The internet has greatly speeded up our consumption of images. My daughter, for example, who at eight years of age has probably seen ten times the number of images Kasia had seen at eight in a Poland only just starting to recover from the impoverishment of every aspect of life brought about by Marxism. But how many images will my daughter remember, how many does she look at long enough for them to burn themselves onto her retinas, and absorb their mysteries? Kasia’s father was a photographer, using the heavy and indestructible cameras available behind the Iron Curtain, Prakticas and Exaktas, with Carl Zeiss Jena or Russian lenses. He processed film himself, and printed, which if you have never done it, is a kind of miracle, using aesthetics and chemicals to freeze a moment in time. He brought photographs for Kasia to pour over. So Kasia grew up seeing her father record and aestheticise the world around him, and she studied monochrome images in her family’s photo albums, showing herself in the past, and people she knew, and people she vaguely knew. All emotion and imagination stirred by the potency of an image. She studied old cartes de visite found in junk shops, she says the image exerts “a trick of the mind”, which frees the imagination to summon up the lives of the people presenting themselves to the camera, imagining the true colours of their hair and clothes, what they thought about, how they spoke. The method she has chosen to work with is wet plate collodion. Which involves chemicals being carefully layered onto a sheet of aluminium or glass in the darkroom (which is a portable one when Kasia works away from her studio), and then covered and placed in a frame that can be loaded into the camera back. The camera looks like one you see in a Western, a wooden box on a tripod, with a black cloth at the back, a lens with bellows. This is not a rapid way of taking photographs. She shoots people. Split between fashion and portraits – although the fashion is undertaken as if it is portraiture. The great advantage of the process is how it encourages Kasia and the model to think about each shot, its more akin to theatre with everything in the frame thought about, like creating a tableau, far from the rapid-fire-increasingly-wild cliché of fashion photography; Austin Powers or the photographer he was parodying, David Hemmings in the movie Blow-Up. Kasia has stayed in London because of its diversity, the world in a city. Here she finds the cultural mixtures endlessly interesting. You can see this love of collisions in her work; past clashing against present, spontaneity crashing against permanence, beauty being subsumed by the swirl of chemicals.